Spring has begun behaving like summer now, with the mercury regularly hitting the mid 30s (but I’m not complaining). After putting up with two bone-aching winters in a row (I moved hemispheres at the end of the Indian winter and at the beginning of the SA one), I’m absolutely over the moon (or sun) re-discovering my predominantly summer wardrobe of shorts, skirts and flipflops. And I’m in the mood for food that feels like fluttery butterfly kisses rather than warm bear hugs. The warm weather has brought with it goodies galore – I spotted loads more strawberries, oranges, nectarines, peaches,pineapples, artichokes and fennel at the vegetable store. I picked up an orchard-full of fruits of which the golden pineapple and the ripe red strawberries were the most enticing with their sweet, summer-filled scents. 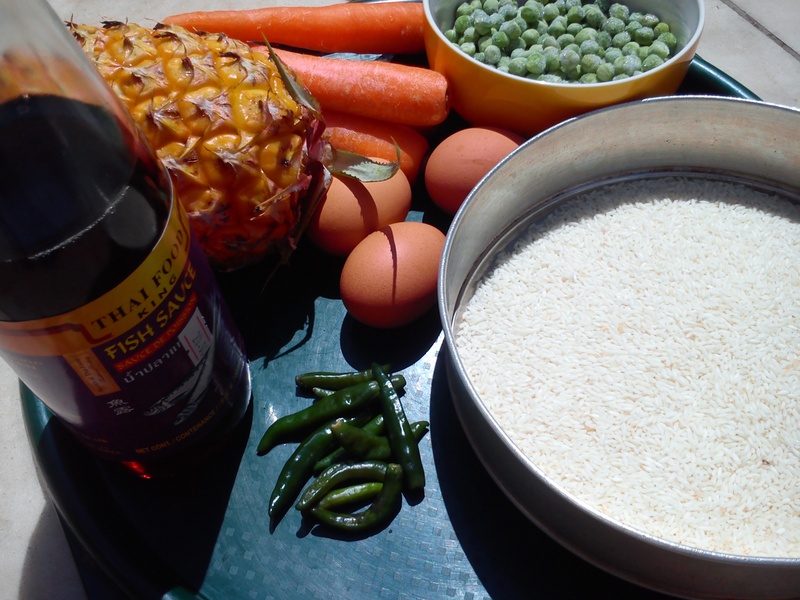 After enjoying the sunset-coloured papayas (must add that SA papayas are the best I’ve ever eaten) at breakfast, I decided to use the luscious pineapple for lunch to make fried rice with a tropical twist. In this recipe, less is more – it’s about letting individual ingredients shine rather than transforming them to create new flavours. There’s no great prep work involved except to cook the rice a little in advance (the previous night if possible) so that your fried rice has the right texture and the grains stay separate. I also made a basic condiment by slicing 4 fresh green chillies and soaking them in 4 tablespoons of white vinegar for 3-4 hours. Drizzle over your rice just before you dig in. Flake the cooked rice gently with a fork to separate the grain. Fry the bacon bits in a pan or wok till crisp. Drain and set aside. In the same pan, heat 1 1/2 tbsps of oil and toss in the carrots and garlic and stir fry on high-medium heat for 2-3 minutes. Beat the eggs in a bowl, pour over the carrots and break up to resemble shredded omelette. Without overcooking the eggs (they must remain fluffy), toss in the sugar, salt (use little or no salt if using fish sauce), peas, rice and pineapple, and stir fry for 2 minutes more. Pour in the fish sauce, mix, turn off the heat. Sprinkle with pepper and serve with the chilly-vinegar on the side.